Indians and Russians attended the flag-hoisting ceremony at the Indian Embassy on India's 67th Republic Day on a frosty, snowy Tuesday morning in Moscow. 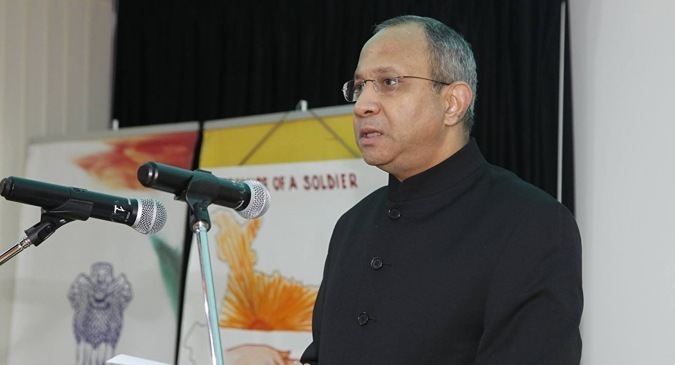 India's New Ambassador Pankaj Saran raised the Indian flag and presided over the occasion. The Republic Day of India was celebrated on a frosty, snowy day in Moscow. In the morning, Indians and their many Russian friends attended a flag-hoisting ceremony at the Indian embassy in the Russian capital. Petals of red roses decorated the pedestal sculpture of Mahatma Gandhi made by a Russian sculptor and presented to the Indian side. The flag was raised by the new Ambassador of India in Russia — Pankaj Saran. The Ambassador warmly welcomed the Indian community in Moscow, and the Russian guests. He read out the message of Pranab Mukherjee, President of India to the nation on the occasion of the Republic Day. Songs were performed and poems recited at the D.P. Dhar Hall of the Embassy of India. Performance of the Indian Embassy schoolchildren was inspiring and enthusiastically presented. Kashmir Singh, President of “Hindustani Samaj” told “Sputnik” correspondent Natalia Benyukh that he has been celebrating the Republic Day in Moscow since the 1980’s, when he was still a student at the present Russian People's Friendship University. In addition, our Russian friends and colleagues always accompany us to this festival — he said with satisfaction. Rameshwar Singh, head of the Indo-Soviet society “Disha” said that this year, the Republic Day of India is being celebrated in St. Petersburg and Tver, Kazan and many other Russian cities, at educational institutions, in which Indian students are enrolled. This has become a tradition — he stressed. The Indian business community, after the recent visit of Prime Minister Narendra Modi to Moscow, hopes to revitalize and expand ties with Russia. — This is the opinion of a yet another participant of the celebrations, G. S. Vijayakumar, Director General of “Varthamana International Traders”. This company, a supplier of ophthalmic equipment to Russia, plans to significantly increase its supplies in 2016. The new Ambassador of India in Russia is optimistic about the prospects of deepening of Indo-Russian ties. 32 years ago, at the beginning of his diplomatic career, Pankaj Saran worked at the Embassy of India in Moscow. Now he is back in Russia — this time as the ambassador. I am delighted to be back in Moscow in Russia, — the ambassador said in an interview with “Sputnik”. — Russia is a great country and one of the most important major powers of the world. To serve as the Indian Ambassador in Russia is a very great privilege. I am excited. I believe that this relationship between India and Russia is one of the most important relationships of the world. We have to build it further and strengthen it and deepen it. It gives me a very good feeling to see here so many Indians, so many children participating enthusiastically in our National Day. Obviously, the number of Indians living in Russia is growing. And they are happy, prosperous, they are doing well. This is a very good way to develop further bonds between India and Russia. I am very happy to be here on the Republic Day.